Celebrate all the wonderful teachers in your life during Teacher Appreciation Week! Whether it’s a school teacher, sports coach, or even a caretaker – these real life superheroes cannot be thanked enough for taking the time to help us learn and grow! This year I created a “Thank you” coloring page that’s easy for even the littlest of ages to provide a gift to their teachers with their own personal touch. Click HERE or on above image to download FREE printable. For the boys, I included a questionnaire on the back of their coloring page. Click HERE or on above image to download FREE printable questionnaire. Thank you to all the hard-working teachers! The boys have mastered the Color-Coded Beginner Piano Sheet Music I created for them, so I thought I’d put together another song. They are super into Star Wars right now, so The Imperial March (Darth Vader’s theme) seemed like the perfect option. Simple, yet dramatically fun – and perfect to get in the mood for our upcoming trip to Disney World! All I had to do was add a few more color-coded note stickers to our keyboard. POST UPDATE: I originally cut down circle dot labels I had on-hand (as seen in my photo), but recently upgraded to these Color Coding Dot Labels, which I highly recommend. The colors coordinate exactly and they are the perfect size for full-sized piano keys / keyboards. …And may the force be with you. ‘Tis the season for roses, hearts, Cupid and the age old tradition of spreading love with thoughtful Valentine’s Day cards! 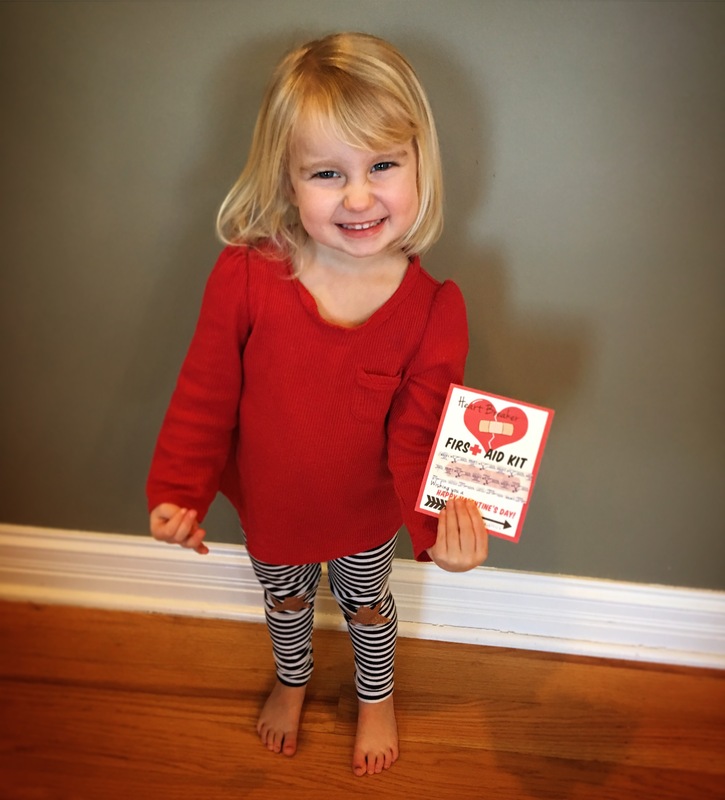 Avery is currently obsessed with decorating herself in adhesive bandages, like they are a fashion accessory – so I picked up some holiday themed bandages to use for her classroom Valentines (one of many amazing finds at the Target Dollar Spot!). 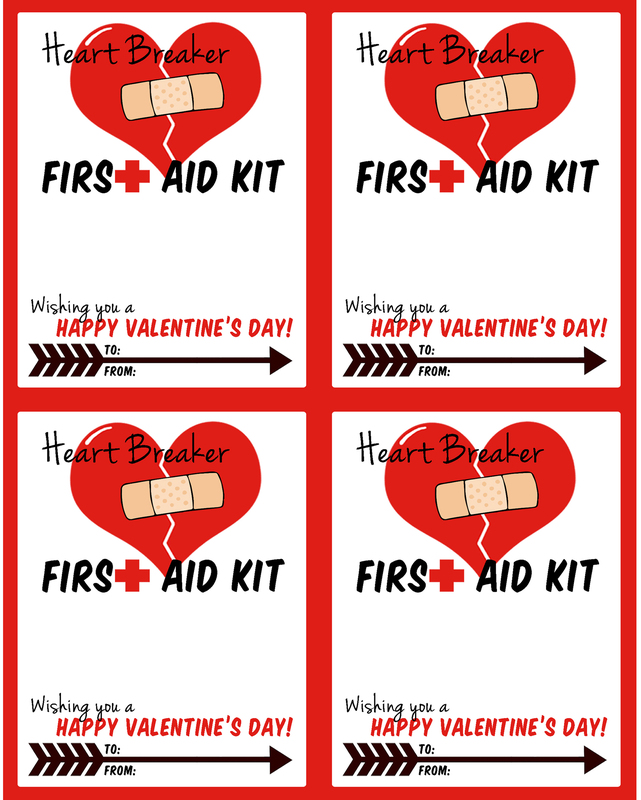 I created and printed the below Heart Breaker Valentine’s Day Cards and attached the bandages with double-sided tape. 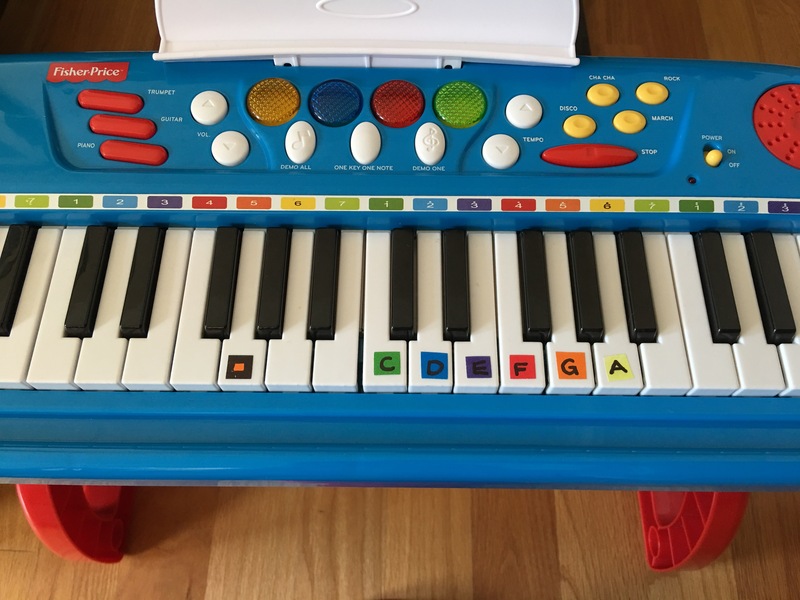 The other day, Jacob was jamming away on his toy piano singing ‘Twinkle Twinkle Little Star’ – eyes closed, head bopping, slamming random keys on the key board… I loved the enthusiasm and figured the boys are probably old enough to start reading beginner sheet music, so I decided to put together a few songs for them. I am by no means a musician, but I did play piano back in the day and remembered some of the basics. I wanted to keep it simple with what I feel is a reasonable goal for toddlers and preschoolers: Find Middle C and play a simple song with one finger (not at all insisting on proper finger placement). I’m not trying to raise Mozart – I just want them to have fun and become comfortable with the basics of sheet music while doing so. We have a Fischer-Price electronic keyboard that has color coding to the keys, so I decided to coordinate with that…. POST UPDATE: I originally cut down circle dot labels I had on-hand (as seen in my photo), but recently upgraded to these Color Coding Dot Labels, which I highly recommend. The colors coordinate exactly and they are the perfect size for full-sized piano keys / keyboards. I then created color-coded sheet music for a couple of their favorite songs. Click on below sheet music image to download a FREE printable. For more song selections, please visit my Etsy Shop. As simple as that – now my boys understand the concept of reading and playing music on the piano. With or without an accurate rhythm on the keyboard, watching their faces and sense of accomplishment after completing a song is absolutely priceless! The kids had a blast – but without a ton of leaves, it hasn’t felt much like fall (to me anyway). So I decided to create a fall-themed craft to set the mood for the autumn season. My boys loved the Stained Glass Sun Catcher Ornaments we made last winter, so I created a similar craft using a leaf shape… Super-easy, no-mess, and perfect for all ages! Cut out the CENTER of the leaf shape with an X-Acto knife or scissors. Prepare colored tissue paper by cutting them into squares. Note: I separated the tissue paper squares into coordinating cup colors for easy selection. I’m not pointing this out to show how overly organized I can be, I’m sharing this to show one of the MANY ways I’ve re-purposed the cups provided in our Easter egg dying kit – Great cups to save and reuse! Adhere a piece of contact paper to the FRONT of your pre-cut leaf print-out, covering the entire outline. (Don’t have contact paper? Packaging tape works as a wonderful substitute!) Then lay the paper down, sticky side up. Now it’s time for your little artist(s) to decorate their leaf… Have them select their tissue paper pieces, and press them down onto the contact paper. When complete, seal the back with another piece of clear contact paper. Trim around the outside of the leaf shape with scissors and tape or hang your masterpiece in a window to enjoy the beautiful stained glass colors! Months ago, Jacob told me he wanted to be Kion from The Lion Guard for Halloween. To no surprise, Evan and Avery wanted to team up with him as Beshte and Ono to help defend the pride lands! For Kion and Beshte, I used orange and grey footed pajamas from footedpajamas.com (while also scoring a 15% off coupon from Retail Me Not – deals rock!). I attached red and black craft fur that I got from Michael’s Craft store (also available online at Amazon or Walmart) for hair, and used fleece fabric to sew on ears and a tail. For Ono, I purchased a white leotard from Amazon and created wings and a tail, using fleece fabric (Fleece is great for this purpose since it does not fray at all). The leotard fabric and skinny arms were a bit difficult to work with, so I chose to use a combination of Velcro and sewing to attach the wings. To give the tail a more 3 dimensional look, I sewed in pipe cleaners between the two tail fabrics. Similar to Beshte – I designed an Ono mask for Avery and created a TEMPLATE so I could make a fabric mask, using felt squares and Stitch Witchery. To complete their costumes, The Lion Guard needs their badge of honor – so again I used my trusty Stitch Witchery to fuse the symbol (from felt squares) to each costume’s left arm. Tip: After printing out this TEMPLATE, I cut out the shapes with an X-ACTO knife, and chalked out a mirror image as a stencil. Now my little protectors of the pride lands are ready to roar on Halloween! Related: See Paw Patrol and Ghostbusters costumes. Mix It Up! by Hervé Tullet has been a long-time favorite book in our house. A truly brilliant and engaging way to introduce the idea of mixing colors. One of the best parts = The kids can mix colors, over and over again, without the actual mess of paint! Another great book to compliment this read is The Wonders of the Color Wheel, by Charles Ghigna. 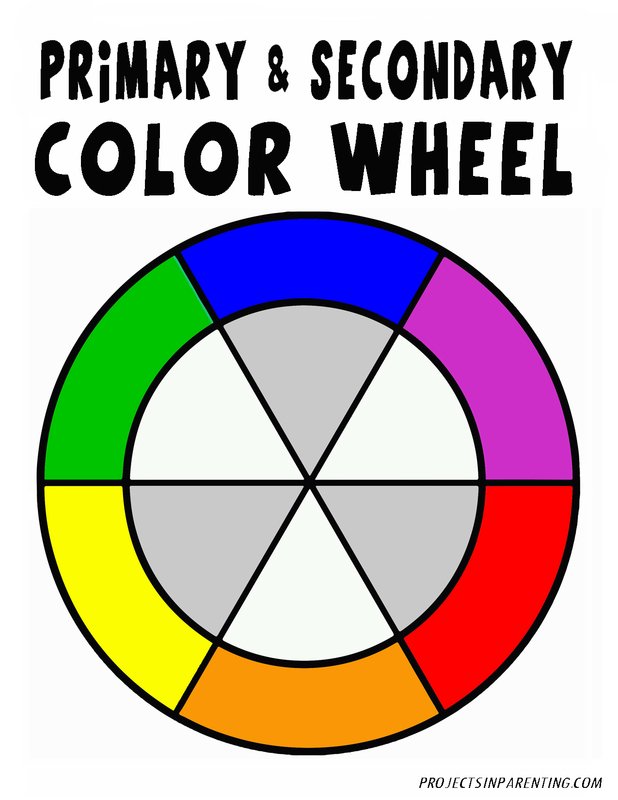 Similar to Mix It Up!, this book explains color combinations, but also touches upon the categorization of primary and secondary colors. 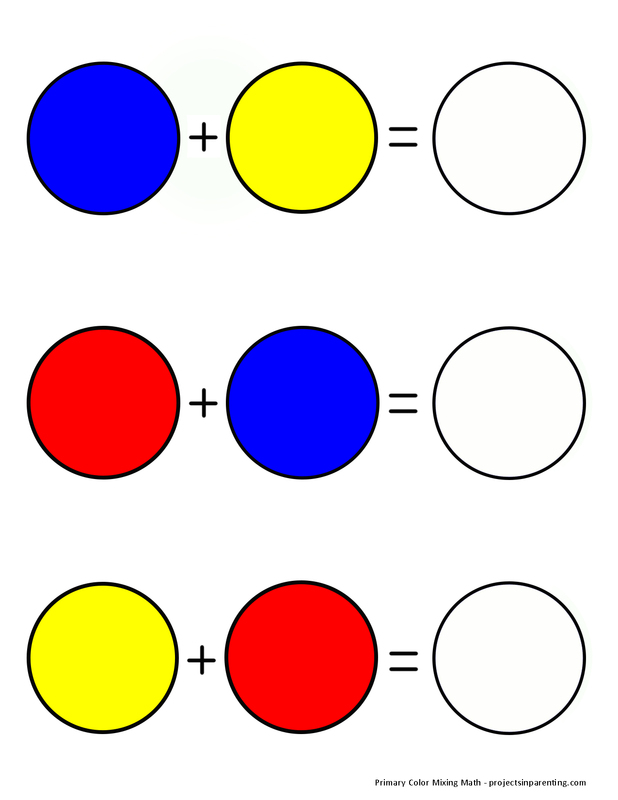 I filled plastic cups with water and used food coloring to dye the cups in correspondence to this Color Math Printable. The boys then poured the 1st two cups in each row (primary colors), into the last empty cup, to create the secondary colors (green, purple & orange). Using the primary colors of Play-Doh (blue, red & yellow), the boys mashed and rolled small pieces together to create each secondary color (green, purple & orange), and place them on their Color Wheel Printable. Using the primary colors of Magnatiles, the boys held the tiles up to a window, overlapping them to discover each of the secondary colors. If you don’t have Magnatiles, any form of color transparencies can work. Thanks for visiting my blog! For more fun kids’ activities and free printables, follow me on Pinterest and Facebook. Shortly after the boys turned 2 years old, they started finding Cory or I in the mornings and asking, “Is Dad home all day?”. If the answer was “no”, I often times had two crying kids on my hands. Understandably (in their minds), they were upset that Cory had to run off to some unknown “work” place, instead of staying home to play with them. Unfortunately for me, I had to break this news to them every Monday through Friday and they would be super angry with me – like it was MY choice which days Cory went to work. While it was neat watching them realize the concept of days, I wanted to avoid the unnecessary tantrums and help them understand their schedules better. As a visual person myself, I decided to put together a weekly calendar *showing* them which days Dad was “home all day” (by putting a picture of Cory’s face on Saturday and Sunday). I printed out the calendar, put it in a sheet protector, and hung it on their bedroom door with a clothespin to mark the current day. Each morning, they would wake up and move the clothespin to the new day. Both Jacob and Evan responded to the calendar extremely well, so I started adding images for almost everything – doctor’s appointments, swim class, holidays, etc. The boys quickly started understanding weekends vs. weekdays and were excited when something new would pop up on their calendar. Although our weekly events pretty much stayed the same, when I knew a holiday or special event was coming up, I would print the future week in advance and simply slide the sheet behind the current week (in the sheet protector) so that it was ready to go. Avery is 2 years old now, and starting “toddler school” this week, so I started using the weekly calendar for her. She is loving the new responsibility of updating her marker for each day, and super excited for her 1st day of school. No more tantrums and full cooperation for the day’s activities (well, most of the time anyway). Either way, a definite WIN! Click HERE for Weekly Calendar Printable. Click HERE for Weekly Calendar Clipart Printable – Simply cut & paste appropriate holiday, event or activity onto your Weekly Calendar. For sports classes such as swimming, gymnastics, tennis, etc., I recommend using images from Classroom Clipart (endless options and free!). This website also has perfect graphics to use for other activities (piano lessons, etc.) and additional holidays. With summer comes water – especially here in Chicago, where the heat and humidity can make a bed of ice cubes sound comfortable. Even with the scorching weather, I like to spend as much time as I can outdoors with the kids – which means LOTS of water activities to keep them cool. We have a ton of fun with sprinklers, water balloons, and the kiddie pool, but sometimes they need a little extra creativity to catch their interest and get them excited to play outside in the heat. With 3 little ones, I try to stick with activities that have minimal set-up time. I’ve seen a ton of great ideas on Pinterest, and as fun as some of them may be, I simply don’t have the time for things like building an extravagant “car wash” system out of PVC, hoses and hanging sponges…. For me, simple = good. And holding the kids attention for 30+ minutes = WIN! Using water sprayers from our local dollar store, I set up rubber ducks and frogs on top of activity cones and the kids practice their aim by spraying them off. Holding the test of time, this has been a favorite activity since the boys were just short of 2 years old. Using an aquarium net, the kids “fish” for anything from rubber ducks to ping pong balls… After they are done fishing, sometimes the kids like to get out kitchen utensils and make “duck soup”. This particular day we were taking a break from the heat, but have done this activity indoors and out… Using an old toothbrush and some soap, the kids enjoy pampering their favorite toy animals with a little spa-day. Playing around with the ‘slo-mo’ feature on my iPhone, I decided to take some clips of the kids splashing around in the pool – SO FUN! Now the boys are constantly requesting I take videos so they can watch their playbacks in slo-mo… Summer splashing at it’s best! Water + chalk = messy fun! !… Great for using left over small pieces of chalk – Just throw chalk sticks into a baggie, pound with a hammer (or the flat end of a meat tenderizer), pour chalk powder into a bucket, and add a small amount of water to make a thin paste… For less prep: Simply pour water on the ground, color heavily in the puddle with chalk, and mix with hands. Whether it’s washing their toy trucks or Mom and Dad’s cars, the kids always enjoy a good car wash.
As simple as construction paper in water – Squish it, squeeze it, and tear it. A great sensory experience. Another go-to activity of mine, indoors or out… Using kitchen utensils, sponges, and a Fine Motor Tools Set, transferring water becomes endless hours of fun. Off in imagination land, the kids love to pretend their toy house in our backyard is on fire and they help put it out with the hose, buckets of water, and/or their Paw Patrol Water Backpack.